I am so excited about this post. 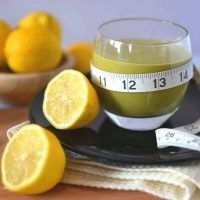 It’s something I’ve wanted to share for years as I’ve lost 56 pounds myself using homemade weight loss shakes which is what I’m about to share with you in this post. Don’t have time to read this post? 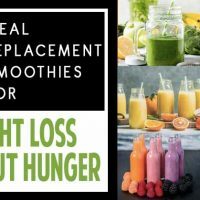 Download a handy print out to stick on your fridge so you know exactly what fillers to add to your smoothies to fill you up and help you lose weight. If you are new to my website I’ll give you a bit of background. 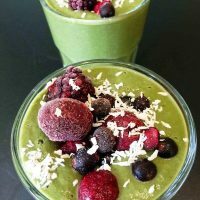 The name, Green Thickie means a filling meal replacement smoothie which is a complete meal with optional greens to make it a Green Thickie. 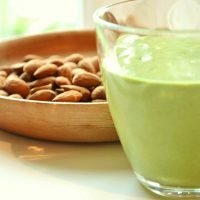 When I first invented the Green Thickie, I started off adding oats to my smoothies to turn them into meal replacement shakes. 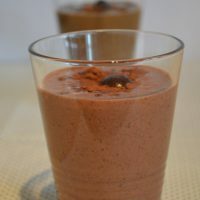 After a while I started experimenting with other ingredients to make the smoothies thick and filling. 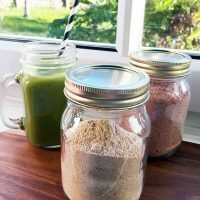 Now I’ve experimenting with grain free diets so I’ve just found a whole load more ingredients that make perfect additions to make homemade meal replacement shakes. I also use my Green Thickies as a great tool for weight loss. 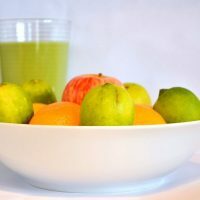 If you drink one Green Thickie for breakfast and another for lunch and a home cooked healthy dinner, you should see results when it comes to health and weight loss. Get started with Green Thickies here. 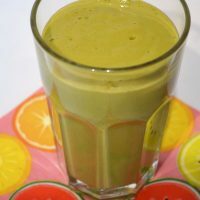 Any of my Green Thickie recipes can be used as meal replacement shakes for weight loss. Green Thickies are designed to be the perfect meal for busy people. If you don’t have time to sit down and eat a proper meal, you’ll get everything you need for one meal from a Green Thickie. Because they are so filling I don’t usually feel the need to snack in between meals and nor do I have time to snack. So I don’t have too many snack recipes on this website. 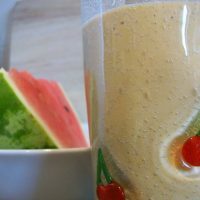 3) I also add something sweet to my smoothies such as dried fruit to make them taste gorgeous. 4) I also add leafy greens as I believe eating leafy greens regularly takes your health to the next level. 6) And finally, to make the green thickie filling, we need to add a healthy whole foods based filler. Keep reading to find out about fillers. 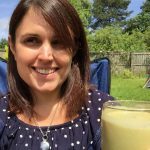 I’m now going to explain the different choices of fillers you can add to your smoothie to make them into a complete meal. And after I explain the fillers I’ll also give you a formula for making your own homemade meal replacement shakes for weight loss. 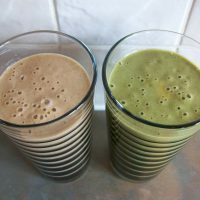 So now that I’ve explained the concept behind Green Thickies, I’m going to give you a list of ingredients which are my ‘fillers’ that you can use to turn any smoothie into a filling meal replacement shake. Each of my recipes serves 2, so all these fillers need to be added to a batch of smoothie that is enough for 2 portions. Further down I will explain the exact quantities of ingredients you need to make your own homemade meal replacement shake. Create your own smoothie with the template at the bottom of this post. 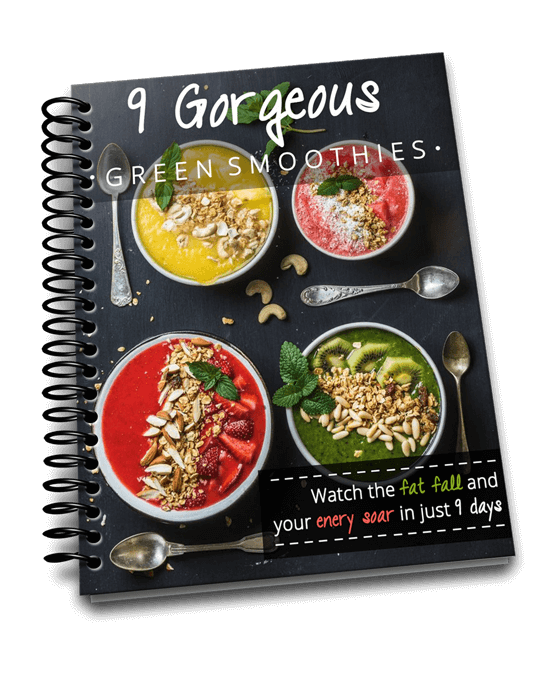 If you don’t want to know how to make Green Thickies, but simply want to make your own smoothies more filling, you can just take a look at the image below. All of the fillers in this image serve just 1. So take the ingredient listed and just add it to a single serve smoothie. You’re done! You’ve now made your smoothie more filling. Please pin the image below or share it on your blog with a link back to this blog post. But if you want to make a complete meal, I suggest you keep reading. Simply adding a filling to an existing smoothie will make it more filling, but it won’t provide all of the nutrients needed in one meal such as enough protein or essential fatty acids. To get everything you need, I suggest you incorporate all 6 elements of a meal replacement shake (Green Thickie). 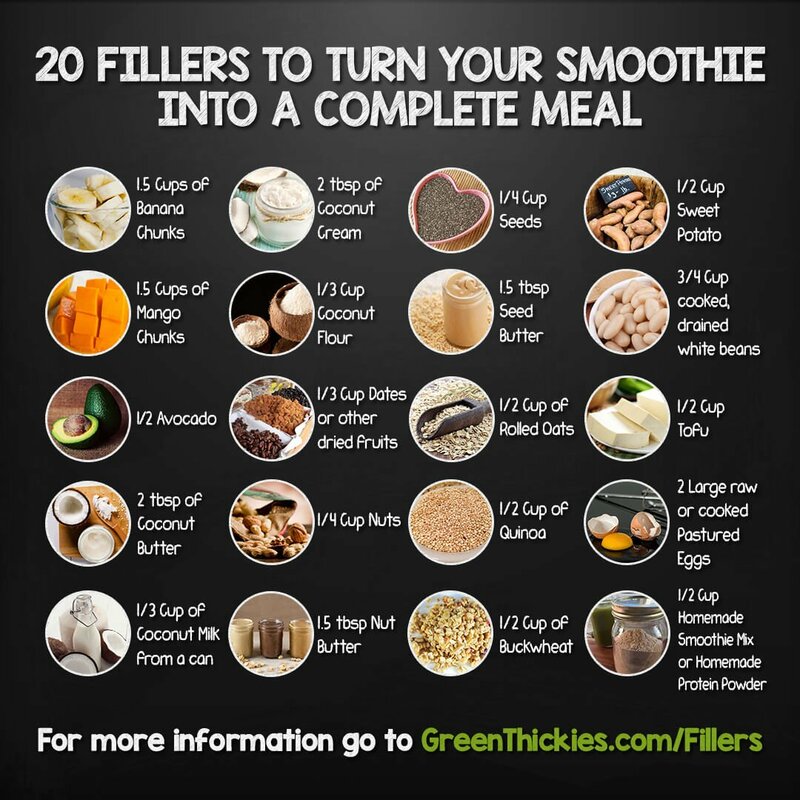 As most Green Thickies recipes serve 2, I have doubled the quantity of fillers in the list below. All of the following ingredients serve 2. If you are making a smoothie for 1, use half of the amount listed below. It takes just minutes to make a big batch of. And if you leave a scoop in your mix, you just add this meal replacement powder mix to your blender in seconds every time you make a smoothie. Can’t get easier than that! Get this delicious filler powder recipe here. All of these fillers have roughly the same number of calories. Each smoothie serves 2 so you would consume half of these fillers per smoothie. This might seem a lot to you but remember, this is a complete meal, not a snack! 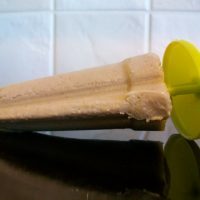 Some of them are bulkier than others so although each shake will be roughly 18 oz/ 1 pint / (500ml) some may be smaller and some larger, but all should fill you up until your next meal. *I have added a star next to the fillers that are easiest to blend without a high speed blender. 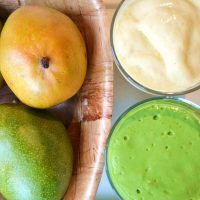 All of the ingredients can be blended with any blender but it is easier to blend if you soak hard ingredients overnight first. 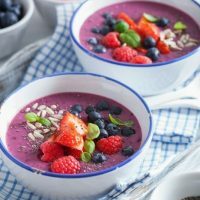 Another option is to grind your grains, nuts and seeds using your blending or coffee grinding before adding them to your smoothie. 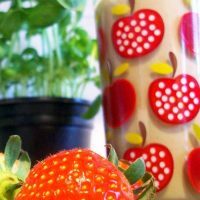 I have chosen these fillers as most of them have a fairly neutral taste, and you’d be surprised how much the sweet fruit can overpower the taste of both the fillers and any greens you add to your smoothie. Quinoa: Rinse then soak these in the smoothie liquid overnight and add straight to the blender. 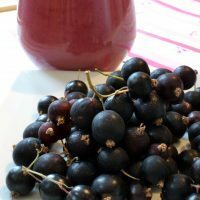 Buckwheat: Rinse these and continue to rinse every couple of hours for 8 hours then add straight to the blender. White Potato: Steam this for 12 minutes and bake it under tender, about 45 minutes. Cooked beans: Rinse canned beans or follow packet instructions to soak and cook dried beans. Seeds and nuts: Soak over night, rinse and add to the blender. * If using dates or other dried fruit, it’s also good to soak these overnight in the smoothie liquid and add it all to the blender. Here is a formula that you can you to make your own shakes for weight loss. 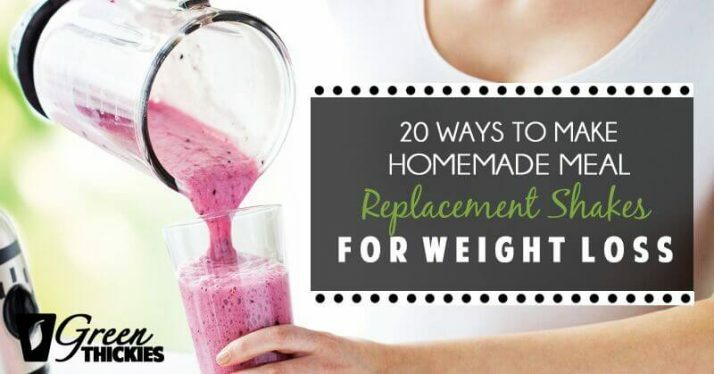 Remember – for homemade meal replacement shakes for weight loss drink 1 serving which is half of the above recipe formula. This formula will make approximately 18 oz/ 2 pints/ 1 litre and to lose weight, drink 9 oz/ 1 pint/ 500ml as a meal replacement. Do this for breakfast and for lunch and then have a sensible dinner that is suitable for the particular diet you are following. This is a great formula for weight loss. 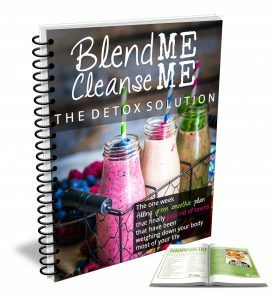 For a complete meal plan – check out my 7 Day Detox to boost your weight loss even more. A lot of people ask me what else to eat besides Green Thickies, so I developed my 7 Day Detox for Weight Loss and Improved Health which will give you a full calorie counted meal plan to help you lose weight which incorporates Green Thickies along with a whole foods vegan dinner and a healthy vegan lunch which is a choice of a salad or another Green Thickie if you are short on time. 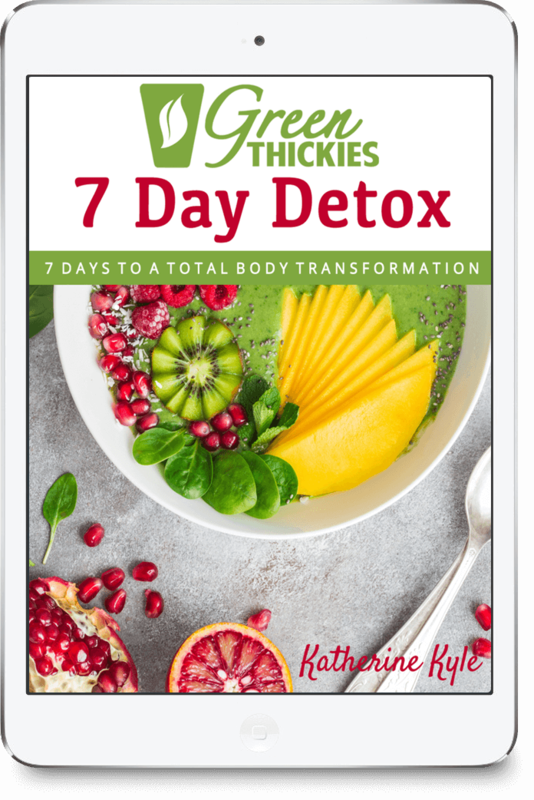 Click here to have a look at Green Thickies 7 Day Detox. 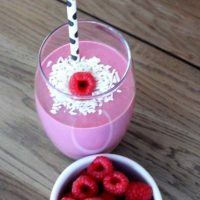 If you want to know more about how to use healthy homemade meal replacement shakes to lose weight, check out my complete guide to meal replacement shakes which contains over 50 of my best meal replacement shakes. 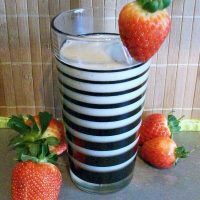 If you don’t want to make your own recipe, you can always use one of mine such as this Natural Protein Shake without Protein Powder. 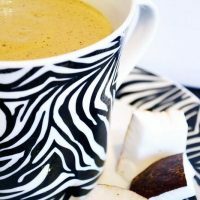 Or if you’d like more to choose from, here are all my favorite homemade meal replacement shakes for weight loss recipes. Sometimes it’s just nice to keep it simple and go back to basics with good sweet, fresh ripe fruit and no sweeteners for this Hawaiian Smoothie. 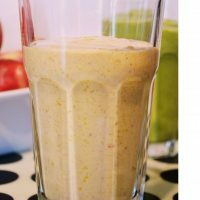 Take this orange and banana smoothie and lie back in the sun and taste the fruity, refreshing and zingy flavours of this summery sensation. 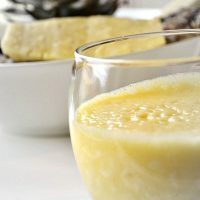 This creamy tropical smoothie recipe will give you everything you need for a balanced meal and it also happens to taste amazing. 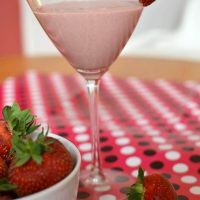 This strawberry smoothie recipe has a classic sweet smoothie taste so it appeals to adults and children alike. Needless to say, it’s one of my favourites and hard to believe there is so much goodness contained in one glass. 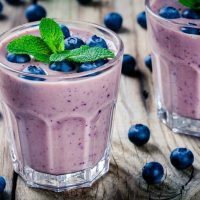 This blueberry and broccoli smoothie is packed full of cancer preventing superfoods.Perfect way to get your raw broccoli bursting full of nutrients. 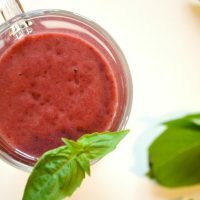 This Strawberry Balsamic Salad Smoothie sounds like it wouldn't work but it really does. This fresh green smoothie is a taste you'll never want to forget. 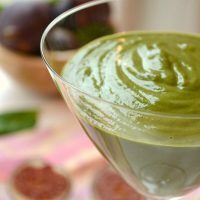 When I saw the buzz surrounding this Pistachio Ice Cream smoothie, I had to convert it into a dessert thickie which made it even more creamy and luxurious. 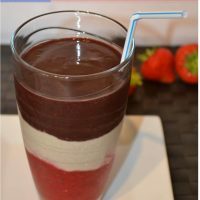 This Easy Black forest Cake Smoothie is my all time favourite and I'm sure it will be yours too once you try it. 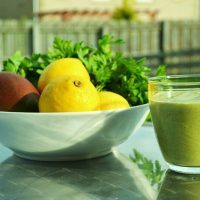 This mango spinach smoothie is very quick, it tastes very fresh and won’t take you any time at all. 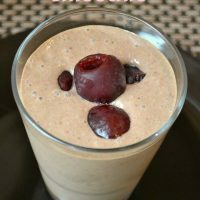 The combination of indulgent chocolate and the tart sweet fruitiness of the cherry is perfectly balanced in this chocolate cherry smoothie. 4th of July Drink: Red, White and Blue, and Still Green? 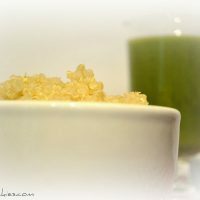 This 4th of July Drink is a very posh green thickie for special occasions. 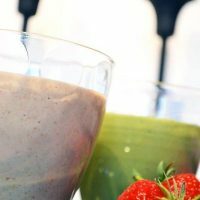 This colourful layered smoothie has the wow factor but still has the same amount of healthy greens, oats, nuts and fruit. 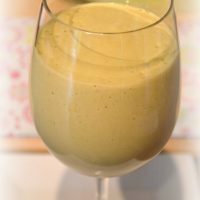 You will have to be brave with this dandelion smoothie but the health benefits will be worth it, and it actually tastes really sweet. 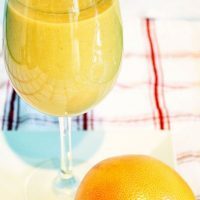 Adding an orange juice base to this orange juice smoothie takes it to another level of gorgeousness. This Vanilla and Blackcurrant Smoothie tastes just like Ribena! It is delicious, sweet and there's no taste quite like it. 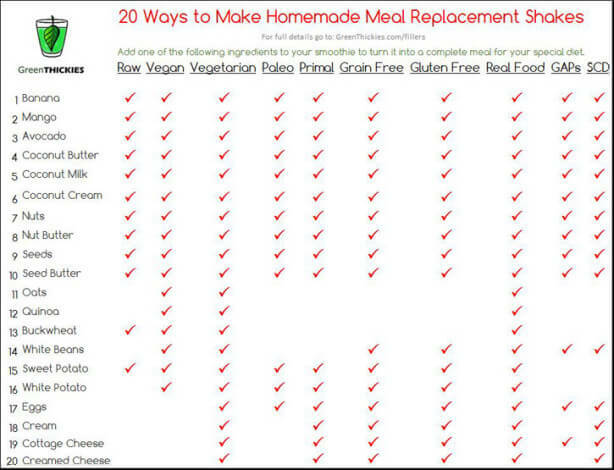 Options for green & meal replacement smoothies. 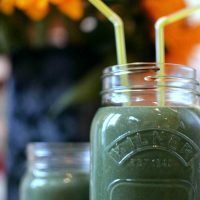 Get all the goodness from the ocean in this Loch Ness Monster Smoothie and find out about the amazing health benefits of Spirulina. 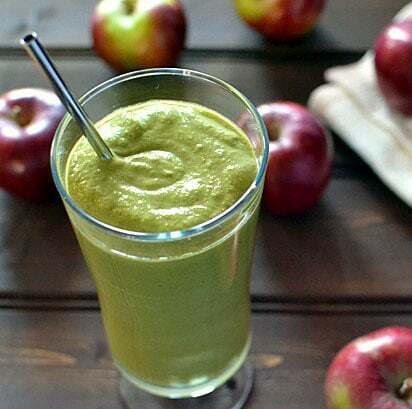 This spicy Apple Halloween Smoothie is guaranteed to warm you up during the cold months of winter. 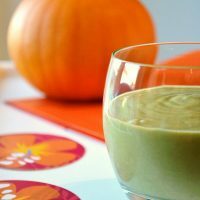 Your kids will eat less candy after this filling drink.If you've never tried adding warming spice to your smoothies, you are in for a treat today. You are going to love this smoothie. 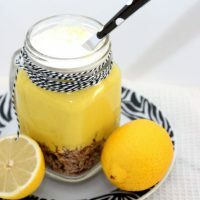 Gorgeous lemon meringue pie smoothie recipe and a free 1 day sample of the Green Thickies 7 Day Diet Plan for weight loss and improved health. Get yours now. 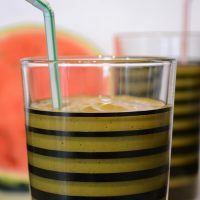 This watermelon smoothie will cheer you up in the rain or cool you down in the sun. It’s extremely sweet and surprisingly thick. 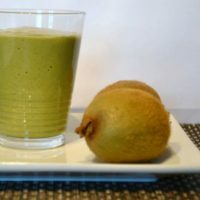 This kiwi and pomegranate smoothie will take less time than you think and has a sweet taste with an interesting tang. Start drinking this Peaches and Cream smoothie instead of your morning coffee and you'll soon see an end to your caffeine cravings. 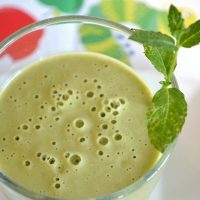 If you’ve never had romaine lettuce in a smoothie before, this Sweet Punch Romaine Lettuce Smoothie is a great one to start with. 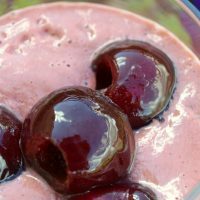 This cherry smoothie is worth pitting cherries for. It’s a very simple recipe but one you’ll be making again and again. 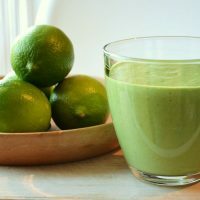 I’ve only recently discovered this healthy key lime pie smoothie and I've already lost track of the number of times I've made it. An all time favourite. 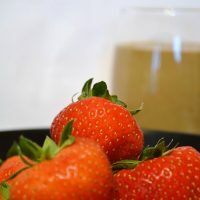 If you’re looking for a filling healthy green smoothie, but can’t tolerate gluten, this quinoa smoothie is exactly what you’ve been waiting for. 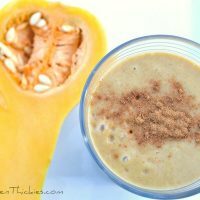 I also share how to prepare your quinoa to add to this delicious quinoa smoothie recipe. 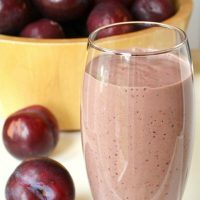 This sweet and spicy plum smoothie will warm you up on a cold day as it has a lovely kick to it. It also has hidden greens for even more nutrition. This sweet and spicy plum smoothie will warm you up on a cold day as it has a lovely kick to it. It also has hidden greens for even more nutrition. This fresh fig smoothie isn’t overly sweet but it depends on how ripe your figs are. The added ginger gives it a lovely edge. 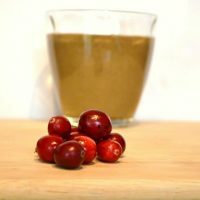 This Cranberry Smoothie is great for reducing inflammation and has all it's antioxidants present, unlike commercial cranberry juice drinks. 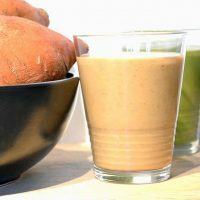 If the thought of a sweet potato smoothie sounds a bit strange, have no fear, this smoothie tastes just like a sweet pie. 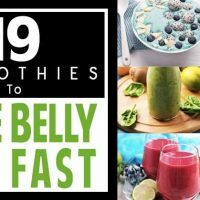 Here is the perfect collection of 19 smoothies to lose belly fat fast. 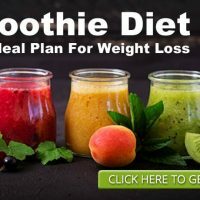 What makes this collection of weight loss smoothies different? They actually work! Would you like a printout of this post so you can stick it on your fridge and use it while you are making your smoothies? Just click here to download it now. I didn’t have much success with rice. It made my smoothie grainy but I know other’s have had success with rice. I would use one cup of rice. If you try it will you let me know if it worked for you? If you like rice, try the quinoa. It is similar to rice, but is a healthier option. I was wondering why yogurt and kefir are not included in the list. They make great smoothies. Yes good options but they aren’t high enough in calories to make a meal replacement smoothie. Hi Just to get it clear in my head – I need to add nuts and/or seed and a filler – the nuts/seeds are not a filler? Just out of curiosity.. why are there no berries used in these recipes? It seems to be the same, 3 or 4 fruits used in all of the recipes. I was hoping to see some actual vegetables incorporated into the smoothies, like zucchini, cucumber and ginger. Is there a reason why you omitted a variety of fruits and veggies in your 7 day plan? I love the chart with all the different ingredients! It’s very helpful and easy to use, so thank you very much! I made my smoothie with greens, fruits, orange juice, pecans and oatmeal. 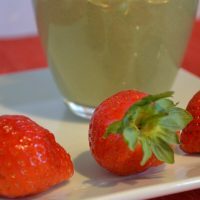 How do I know how many calories I consumed? Hi, I actually need to gain weight in order to be healthy. I am having problems meeting my calorie and macronutrient daily goals (2000 to 2500 calories a day) due to not having access to lots of good foods, not having a lot of different food options, not having enough time to eat, or not being home to eat. Would it be okay to use these meal replacement shakes in another way, which would be to supplement my other meals so I can get closer to my daily calorie and macronutrient requirements and have something to give me nutrients and energy when I’m not home and don’t have enough food for the day? Can I drink these in addition to my other regular meals/snacks, because what I’m currently eating isn’t enough to meet my daily requirements? Thanks in advance for any advice! 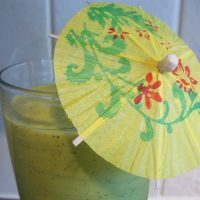 Has anybody used the Kitchen Aid blender before to make their Green Thickies and smoothies? I have been reading through the site and keep seeing a different order of ingredients. Liquid and dry first then greens, filler , etc. i also read another part of the site says liquid then greens, then fillers, and fruit. Confusing. I just need to know before I waste ingredients and money trying to blend a smoothie. I tried something like this a few years agoo and never liked anything mixed together. All to the consistency of applesauce. 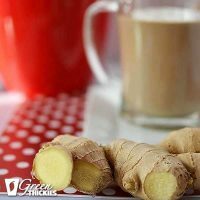 I think it does depend on your blender and the recipe, I’d recommend making each Green Thickie as described in the recipe. Please give chia a try. 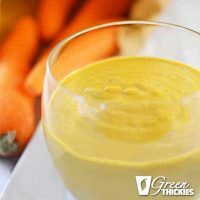 Soak 1-2 tbs in smoothie liquid for 15 minutes to overnight. 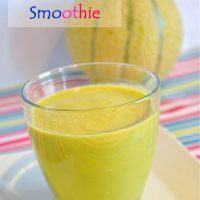 Blend thoroughly into smoothie. Very good protein, essential fatty acids, fiber and a great thickener. How long can I store my shakes in the fridge before they go bad? 1) Can i have it for dinner instead of lunch? It’s dinner that i usually don’t have time for. 2) I’m confused with the filler. 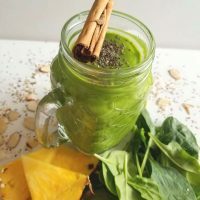 Let’s say I make a big batch for 30 days and how much do i put in for 1 serving of smoothie? 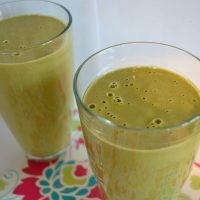 1/4 cup of filler for each green thickies’ smoothie recipe and it makes 2 servings? And then ‘1/2 cup for the whole batch’? I’d like to prepare fillers for the whole month & make 1 serving of smoothie at a time. Hi there 1) Yes you can have it for any meal you choose 2) if you made a big batch for 30 days, if you drank 1 serving per day you would need to make 15 batches as each batch serves 2. Yes that’s right. 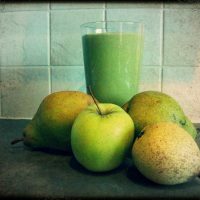 Yes there are loads of gorgeous Green Thickies recipes in this post. Try taking one to work and drink that instead of snacking and see how you feel? Yummy!! I really enjoyed your green thickie recipes,I personally like everything green!! I personally feel better every time I drink or eat something green lol. Yes greens really do wonders for your health. Me too! Thank you so much for the nice comment. Ever since I loved meal replacement shakes because of its advantages and good for weight loss. 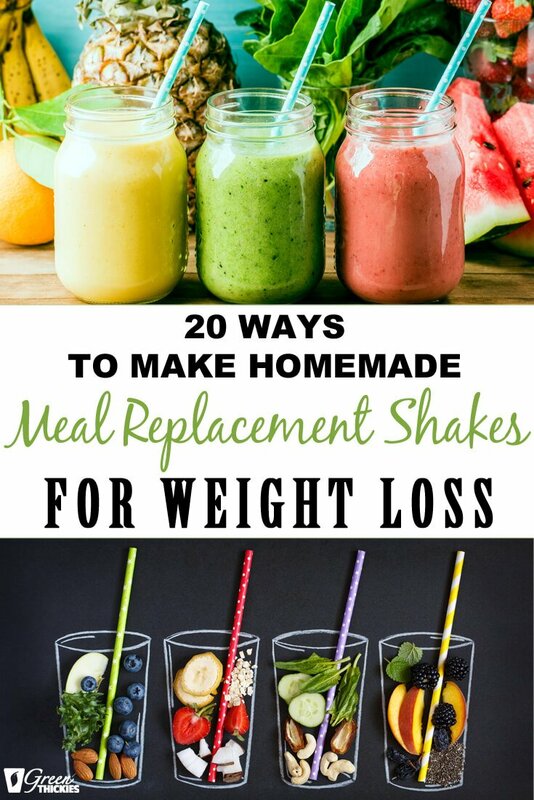 And through these ways on making a homemade meal replacement shakes, I’ve learned different recipes which are suitable for all types of diets. And the good thing is they are all tastes good. Thanks for this.